Offworld Trading Company’s premise is that you control one of several companies attempting to take over the colonization of Mars. The goal is to earn money by exploiting Mars’ resources, then use that economic dominance to buy out every other player in a hostile takeover. 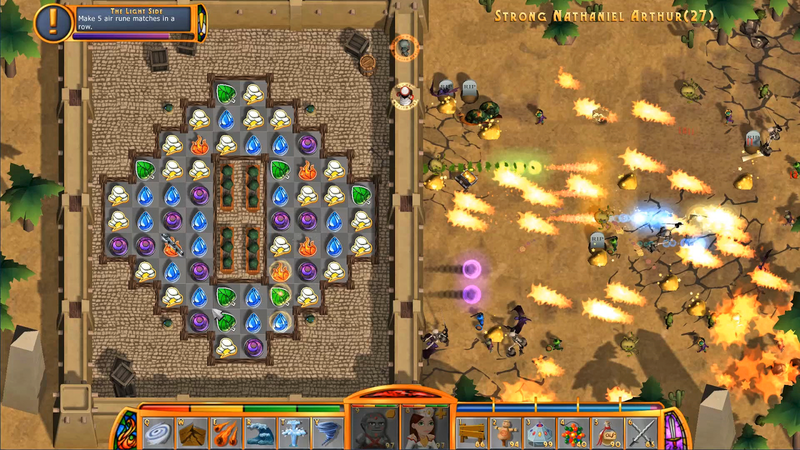 Players make claims on land to gather raw resources and then use constructed buildings to convert those raw resources into others. So water can be converted into food a hydrolysis factory, or into oxygen and fuel through electrolysis. There are 13 resources in all, to be used for life support, building, or just for selling. Based on Soren's track record, this is clearly something to watch as it develops. I've been playing a little game on PC the last couple of days called ReignMaker, and it's quite addictive. It's a mash-up of a city builder, a match three, and a tower defense game, and believe it or not, it all works swimmingly. Here's what's going on in that one screen. There are waves of enemies advancing from right to left. When you match three on the left side (your tower, in essence), you launch an attack. If you match three across, it's a concentrated attack of multiple shots along the same row, which is useful if enemies are lined up behind each other. If you match three vertically, it's an attack along multiple rows (but only one shot per row). So your matches trigger directional attacks against the onrushing enemies. Not done, though--not nearly. You can also buy special units (you can see them walking along the wall separating you from your enemies) that have special functions. Archers, for example, who fire arrows at enemies, or nurses, who add to your health bar. At the bottom of the screen are spells you can cast, plus special weapons you can use. All of these get researched in the town that you go to between battles. Nope, not done yet. When you kill enemies, they sometimes drop money, or scrolls, or treasure chests. You need to pick these up before they disappear, but if you do, it takes your focus away from the match three areas. It's pretty damned busy, in other words, but in a very cool way. And there are a ton of different playing fields for battles with unique situations. Like I said, it's quite addictive, and an iOS version is being worked on, so it should be available on mobile devices fairly soon. The last note today is about The Show, as Eli and I (and Gloria, who is just starting) continue to put time into our careers. It's amazing how much this game feels like real baseball in subtle ways. Arm angle, for example. There are a dizzying number of different throwing motions in the game, and the game does an unbelievable job of mimicking how difficult it is to pick up the ball from certain arm slots (sidearm, for example, but there are several others). It also has certain pitchers falling away from the mound on their delivery instead of a straight follow-through, and that makes it more confusing to pick up a pitch as well. There are a million little details in the game, and combined, it creates a reality palette (how's that for an imaginary phrase) that is entirely convincing.